Welcome to the ninth installment of a series about destinations primarily associated with presidents of the United States. Last week we went to Arlington National Cemetery to visit the grave of JFK, a president who was assassinated. Today, another assassinated president, Abraham Lincoln, will be our focus. It just so happens that I saw both JFK’s grave-site, discussed last week, and the Lincoln birthplace on the same vacation in 1969. 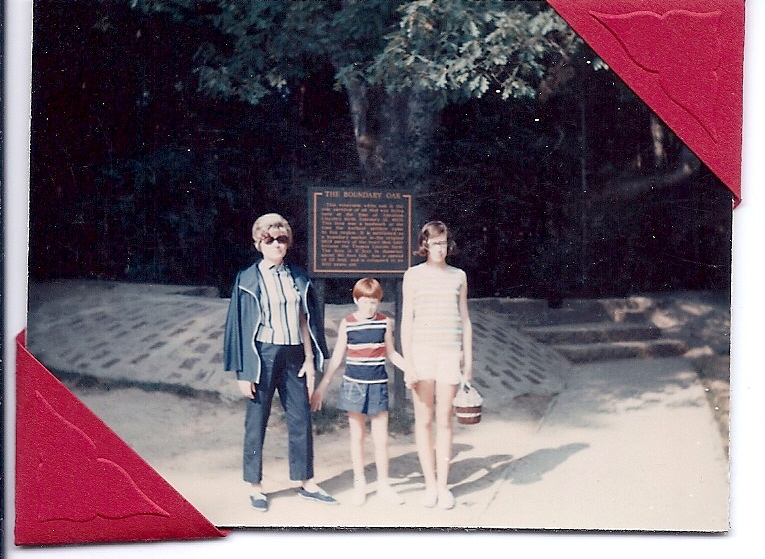 For most of my elementary years, we lived in Georgia and vacation meant a wild ride back to Texas to visit family. 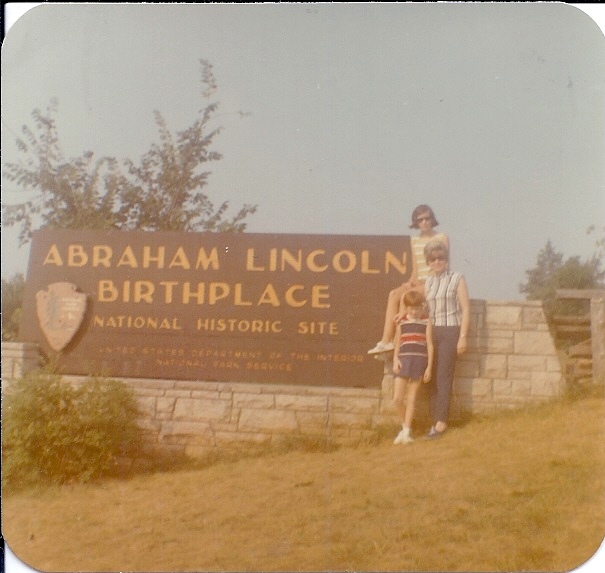 We finally moved “home” in August of 1966 and in the summer of 1969 Mom wanted us to experience a traditional family vacation focused on important American landmarks. Before we got home, I’d fainted on the streets of Williamsburg, eaten my first lobster at a restaurant next to the Gettyburg battlefield and waded in the Atlantic Ocean, but we started with Abraham Lincoln. A few weeks back FDR’s beloved Springwood was my subject and if ever a president was defined by his birthplace, I’d say it was Roosevelt. Seeing his childhood home helped me understand the man. That’s not how Lincoln’s birthplace made me feel. My photos show my mom, my sister and I, full of anticipation by a large National Park Service Sign announcing Lincoln’s birthplace. Another picture shows us standing before a smaller sign explaining why the cabin we are looking at is not exactly Lincoln’s birthplace, but a reasonable facsimile. Quite frankly, I was not impressed. Going to the NPS website for Lincoln’s birthplace preparing for this blog, I saw the picture of a large memorial that is completely unfamiliar to me. I’m sure my dad drove by it, but I guess I was already disgusted with the cabin’s facsimile. Speaking of driving by sites, I’m afraid that’s the way I saw most of Washington D.C. on that trip, zipping by in the family car. 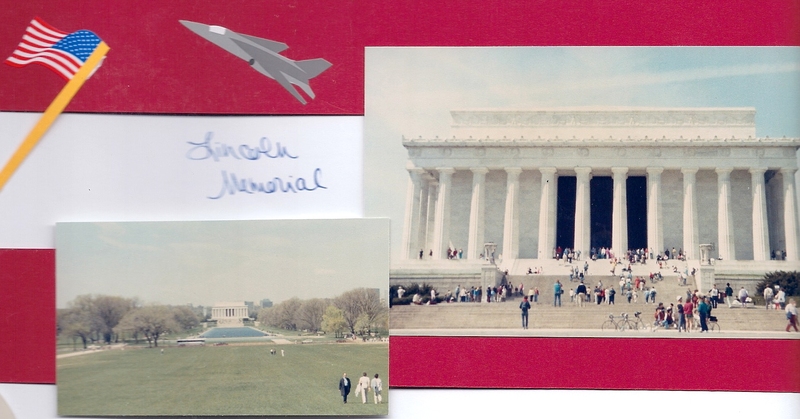 I appreciate my parents making the effort, but the Capitol, the White House, and all the Memorials – Lincoln’s Jefferson’s and Washington’s were merely viewed through the window of a baby blue Pontiac Catalina. Discovering the cabin was a reasonable facsimile – not the real thing. Fortunately, I’ve been to Washington D.C. since then. My job flew me up there and then a business colleague served as tour guide for several days. I still didn’t get very close to the White House and the Capitol, but I actually made it inside the Lincoln Memorial. That was a WOW moment. I understand Lincoln’s contribution to America. It seems inevitable to me that slavery would have eventually been abolished one way or another, but without Lincoln, I doubt if the United States would have been preserved. He was an incredible man, destined to serve his country at a critical time. His memorial in Washington D.C. is sufficient to the cause of honoring him. The statue of Lincoln inside the memorial is huge, gigantic, enormous – just like Lincoln’s legacy. Everything I did not feel as I stood by a facsimile cabin or rode past the memorial in the family car rolled over me when I finally stood next to his massive statue. Though I had not anticipated them, tears overwhelmed me. I’d already been to several other sites by the time I got to the Lincoln Memorial. Parking was a real hassle and I wondered as we got out of the car if it was going to be worth the frustration and the climb up all those stairs. Let me assure you that it is. As I stood inside the memorial,and read his words on the walls, the hair on the back of my neck stood out. Then as I left the memorial, I stood at the top of the stairs and other words echoed in my ear, “I have a dream…” I wonder if Lincoln had any idea how long it would take for emancipation to become equality? I often hear God criticized for the faults of Christians and it angers me, because God should not be judged by his frail followers. I feel the same way about America. We Americans don’t get everything right. In fact, we do a lot of things wrong, but that does not diminish America. Our Constitution, the Declaration of Independence, the Bill of Rights, the checks and balances of our government – these are the real America. Even a president with his four or eight year of power are merely a blip on the face of our great nation. Lincoln knew that. Martin Luther King knew that. Do you? An awesome presidential destination is in Rapid City, SD and the Black Hills with Mount Rushmore. Rapid City has the City of Presidents, which is a life sized bronze statue of all our former presidents on the street corners of downtown Rapid City. For more information check out: http://www.visitrapidcity.com/whattodo/thecityofpresidents/ for more information. I need to put that on my wish list!